I think I’m coming to terms with Marvel’s Agents of SHIELD, adjusting my expectations and criticisms to factor in that this is not a Joss Whedon project. At least it’s not a present day Joss Whedon project of Firefly and Avengers level, more like one from the early seasons of Buffy. There are sparks, moments and suggestions of brilliance, but as a whole… it’s still just a bit amateur. 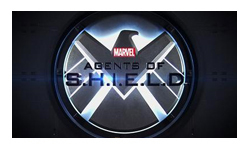 The thing is that we’ve got used to expecting more of television and Marvel’s Agents of SHIELD just doesn’t get there. The arcing storylines are over-worked and fail to really engage – relying on exposition and catchups to remind you constantly of how things fit together, why characters are mad at each other and what the threats are. For the purposes of those plots, the characters have to be pretty one-note and growth only ever comes in fits and starts. Combining those factors means that the base dialogue is rather clunky and the acting is often equally lacking in subtlety. There’s a lot of plot packed into the season and by the time I’d finished it I’d pretty much lost track of where we’d started. Not least because several elements kind of loop. Trusting Ward, getting betrayed, trusting Ward, getting betrayed; seeking answers to questions, each of which only raises more questions; keeping secrets, everyone being mad about that, getting over it, keeping secrets. They all just go round and round. It can result in kind of checking out of the major plot and letting it wash over you. Which is maybe for the best, because the real high points of SHIELD are in the moments between the plot. The cast and writers excel at the little moments, the asides, the sarcasm, the relationships. They have that Whedon ability to be actual human beings, to be happy and sad at the same time, loving and hating the same person, being brave but scared, all the seeming contradictions that actually make people real. It feels like those get drowned out when it comes to the bigger plot moments and storylines, before being switched on again for a 30sec scene over the closing credits. I don’t know whether that’s due to inexperience on the parts of the writers and cast, or whether it’s a deliberate choice. But it makes for an uneven series. It’s the same problem some of the super-hero films have, building walls between character moments, plot moments and action moments. SHIELD is getting better I think, certainly this season was a lot more polished than the previous season, but I think it’s got a way to go and it would be nice if Joss could come along and speed it on its way.